#spon: I’m required to disclose a relationship between our site and Fellowes. This could include the Fellowes providing us w/content, product, access or other forms of payment. I often say that I am the most disorganized, organized person I know. It’s true. There is a method to my madness, though. Besides wanting to become more organized in the new year, I am also very concerned with identity theft. After that Target fiasco the end of 2013 — and I’m sure things like that will happen again– I need to protect myself and my family from identity theft. And for reasons I cannot understand, we get LOADS of junk mail. It gets ridiculous. I just love the pre-approved credit card offers. Sigh. I used to just throw them in the trash unopened. The more I heard about identity theft, though, I realized I better tear them up. Well, that gets old. Fast. I knew we needed a shredder. We needed something to handle the volume of junk mail, staples, and credit cards. Another concern we have regarding the perfect shredder is our puppy, Baxter. He is an extremely nosey curious little pup. Every single time we use the shredder he runs to jump up on it to see what’s going on. He’s still not quite tall enough to reach the opening where the paper/credit cards go into, but it won’t be long. Thank goodness the Fellowes P-12C shredder from Walmart has the advanced patented SafeSense technology. It will sense his little paws and automatically stop. That’s a load off my mind. In all honesty, my husband uses our Fellowes shredder more than I do. He’s a bit obsessed with it. The P-12C can be purchased at Walmart Stores nationwide and at www.Walmart.com for a suggested retail price of $99.97. What do you look for in choosing the perfect shredder for your home? I have a shredder I love, but don’t use it very often. I need to fix that. I don’t have a shredder, but I definitely need one. I love love love my fellowes shredder! We love our Fellowes shredder – gets the job done and does it well. That’s a great infographic. The side by side by side comparison is really helpful in getting the right one for your needs. I need to FIND my shredder. I have one, just have no idea where it is since we moved into the house over a year ago. I have the same shredder, it is fantastic. And we shred everything! I have this shredder and love it! Works soooooo good! The shredder you show at the bottom is the one I own. I really love it. It works beautifully and I give it a lot of use! The jam blocker is awesome! I have found my Fellowes shredder to come in very handy. I seriously need to invest in a new shredder. This one looks like a really nice one! What a great review. I have a shredder and I rarely use it. I love my shredder. Before I got it, I felt like I had to burn all of my documents that had personal information. Identity theft is crazy. I definitely need to invest in a new shredder! ahh i really need a shredder for my blog work i do at home ! im definitely going to look into this! I had no idea that they have shredders that can detect a puppy paw! That is awesome. Thank you so much for all of the questions that we should ask before buying one. It is appreciated! God bless everyone! I keep telling myself I need a shredder, and I really do. The infographic helped me figure out which kind I need, thanks! I think this is a great shredder. Definitely worth the investment. I once bought the wrong shredder – it didn’t do the criss-cross cut, so it was much easier for an identity thief to piece things back together. So glad Fellowes makes them with GOOD protection in mind. I could use something like this. I do worry about properly disposing of important but no longer needed papers. I love that graphic. I didn’t know there were different types of shredders for different security needs. We don’t have a shredder. I either tear up whatever it is, or cut it up with scissors. We could use a shredder though. It would save me some time! 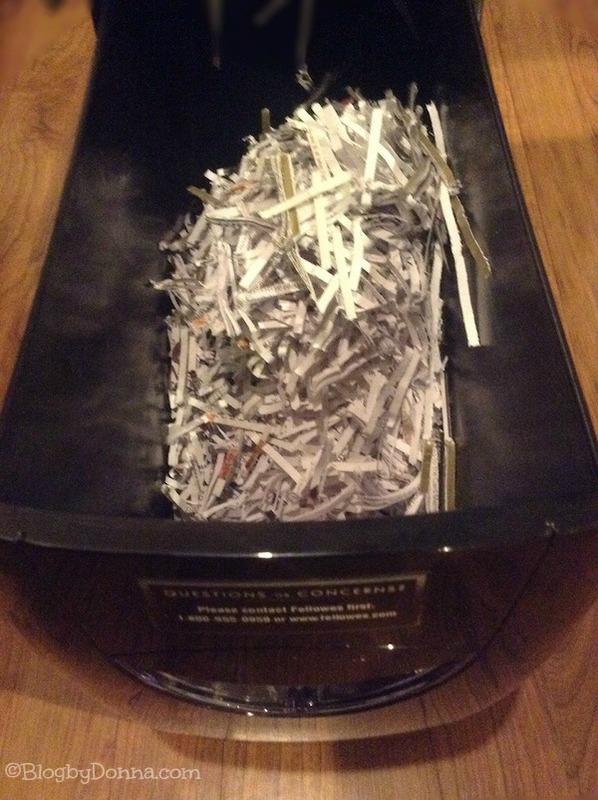 As a blogger, I need a shredder that can shred boxes…. Our old shredder is pitiful and we definitely need something nicer. This looks awesome! 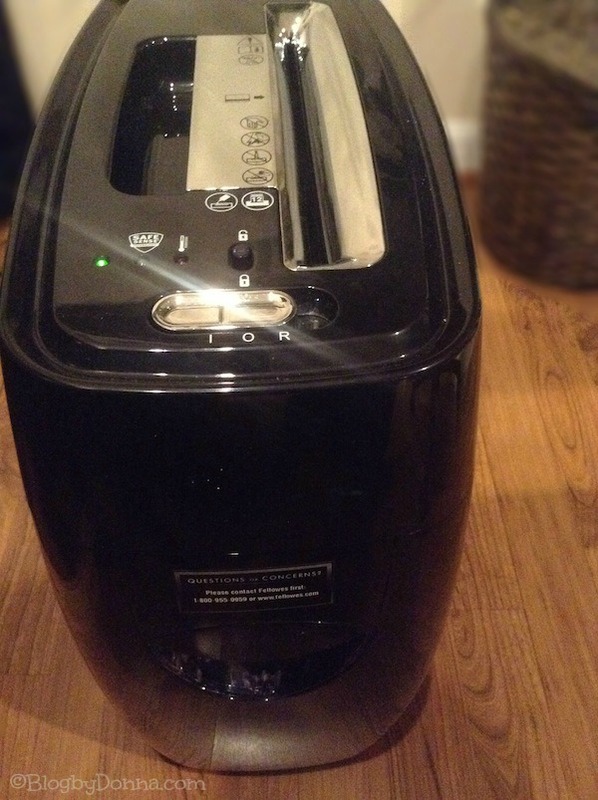 We have this same exact shredder! Identity theft scares me so much. Knowing that whatever comes in the mail is getting shredded to pieces, makes me feel so much better. We’ve become so accustomed to having a shredder that I forgot what it’s like without one. We shred anything with our name and address on it. Getting a nice one that fits your needs will pay for itself in years of use! i have a shredder, but it is not fellowes. i wonder how much of a difference it makes. they all seem to do the same thing. I love that graphic! really makes it easy to figure out what would fit your needs. I really need a shredder. Thanks for posting this. This sounds like the perfect shredder! I was just telling my husband the other day that we need a shredder! We love our Fellowes Shredder. I use it daily. I’ve never had a shredder before bit considering that I shred everything the old fashion way (my hands), I seriously need to get one. We have this exact shredder and it works great! I am very happy with it, and I would recommend it for sure! We recently went through a ton of credit cards, this would have been great! I have a shredder just like this. I don’t use it often but it comes in handy when I need it. Never thought before to own a shredder. I do now! I think it must be powerful and fast working! I truly need to get a shredder, so important! Great review of the product. We have a Fellows and love it! I like that it will shred credit cards. I have the same shredder at home and I love it. I was fortunate enough to win it in a blog contest several years ago. It was my first win :). I appreciate the safety features especially with two small children in the house who at the time I received it were toddler and infant and into everything.